Armchair Fiction presents extra-large editions of classic science fiction double novels with original illustrations. 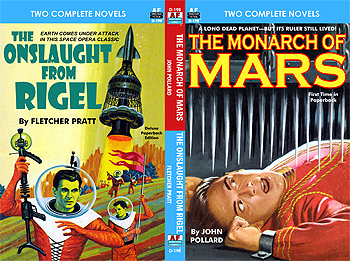 The first novel is from the pages of Fantastic, “The Monarch of Mars” by John Pollard. No matter how carefully a project is planned, something can always go wrong, as Alfred Kennedy well knew. He wasn’t the first member of the Martian royal family to be sent on a foreign mission, but it looked like this mission might be his last. His problem was a serious one: An invading race of barbarians, already overrunning the red planet, was about to take over his defenseless city and slaugh¬ter everyone in it. But with a carefully laid plan, Kennedy sought to save his people from impending destruction. That plan involved gathering together an elite group of people; a group of people whose special skills, if put to work immediately, might save his people, and his world, from destruction. That group of people’s location: Earth. The second novel is “Onslaught from Rigel” by a well-known author from science fiction’s golden age, Fletcher Pratt. When “Onslaught from Rigel” first appeared in Wonder Stories Quarterly in 1932, author Fletcher Pratt was already well known for any number of popular science fiction tales, including “Reign of the Ray,” and “The War of the Giants.” In this story he combined his knowledge of warfare of the day with a supposition of what future war might be like, to spin a yarn vivid and fertile with scientific imagination. “Onslaught from Rigel” is an interplanetary war story about other solar systems and other universes. It deals with alien creatures with the ability to travel through interstellar space—creatures driven by fear, necessity, and by the will to conquer. And when these alien hordes came to Earth in mighty waves, with scientific powers far beyond us, it seemed their dominance over our home planet was a foregone conclusion.